A blood test to detect the human form of mad cow disease before it causes symptoms is a step closer, say experts. Spanish and US scientists have found a way to detect infection in hamsters before the animal shows signs of illness. More work is needed before a similar test could be used in humans, but the findings offer hope of a screening test for vCJD, Science reports. Currently, it is only possible to confirm vCJD infection after death. A test for vCJD is badly needed, especially now that some cases appear to have been transmitted by blood transfusions, say Dr Paula Saa and colleagues from the University of Texas. In the UK, there have been three reported cases of variant-CJD associated with a blood transfusion to date. The first of these was identified in December 2003. 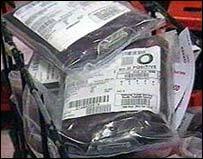 Since then the Department of Health has asked all recipients of blood transfusions not to donate blood as a precautionary measure to protect the blood supply from vCJD. This is because it has not yet been possible to screen donated blood for vCJD, unlike some other infections. The test developed by Dr Saa's team detects prion proteins - the infectious agents that are thought to be responsible for vCJD. Normally, prion concentrations are only high enough to be detectable in the brain and some lymphoid tissue at a time close to they symptomatic stage of the disease. To get round this, the scientists used a technique called protein misfolding cyclic amplification (PCMA) which amplifies the quantity of prion proteins in any sample taken from the body. This test accurately identified hamsters that had been infected with prion proteins. Furthermore, no false-positive results were seen in 38 healthy hamsters. The scientists believe that the test could ultimately be used in humans. They told Science: "Although technically more challenging, the PMCA technology has been adapted to amplify prions of human origin. "The ability to accurately detect misfolded prion proteins in the pre-symptomatic stages of vCJD would potentially help to reduce the risk that many more people will be infected by this fatal and terrible disease." A spokesperson for the Health Protection Agency said: "It is very significant that the agent that causes prion disease has been shown to be detectable in the blood of infected but otherwise well hamsters." But he said there were stumbling blocks that needed to be overcome before a similar test could be used in humans. "A brain extract from healthy hamsters was used to undertake the test. Until a substitute is found for human brain extract, we cannot have a diagnostic test that can be applied to human blood," he explained.